7563 W Sand Lake Rd. The Whiskey has become quite the hot spot since it’s opening in mid 2015. Sadly with so many restaurants that have opened in Orlando since that time, It took us a while to make it out there, but fear not, we did go and we did it up big. When we first arrived, I thought the spot looked familiar, and that is because this use to be the location for the now defunct Cricketers Pub & Eatery. Cricketer’s was a bit larger than a hole in the wall with a very basic layout. Some of the design themes from the original location are still in tact, which really work fine with what the Whiskey’s design team has imagined. Once inside, there is one long bar that runs across the left wall with a view of the open kitchen. A small stage is toward the back, with a few rows of wooden tables across the back wall and a hand full of larger communal style tables in the middle. Seating can be limited as this is set up like a tight narrow hallway, with a first come first serve basis and you may be eating or drinking at one of the big long tables. The food here is very chef driven, even if they do specialize in burgers. The culinary team is always striving to put out plates that are visually stunning while offering an elevated twist. The Whiskey uses fresh and local ingredients from the eggs and produce, to the grass fed game meats to the hormone & range free chicken and organic produce. Burgers here, are a big thing. They take pride in their burgers here, and the results and myriad of awards speak for themselves. The burgers are large and packed with flavor and a variety of toppings that are cooked to your liking. Want something different than beef? No problem, as The Whiskey has Bison, Elk, Camel, Wild Boar and Wild caught sockeye as well as a burger topped with a 20 hour smoked beef brisket. They make some pretty mean salads here too, and have great side options and a variety of starters to choose from as well. The Whiskey Onion Rings and the Parmesan Truffle fries are not to be missed. You can order them seperate or upgrade them as a side item for your burger. Of course, The Whiskey would not be it’s namesake without that great old time alcoholic beverage known as whiskey. They boast a whopping selection of over 200 kinds of Whiskey, Bourbon, Scotch and Rye. The official count is something like...85 Whiskeys & Rye, 66 Bourbons, 52 Scotches, 21 Irish Whiskeys and 10 Rare & Limited bottles. They serve it by the shot, and as mixer in a variety of cocktails. Shots go from a couple of bucks all the up to over $32.00 for a shot and over $75.00 for a regular serving. They do serve beer and have a few other spirits available as well. Fridays and Saturdays are always packed at the Whiskey. Seating is first come first serve, as they do not take reservations, and you can see that this isn’t the biggest restaurant on Restaurant Row. The Motley Cucumber on the left made with Damrak Gin and an Old Fashioned with Old Forester 100 proof bourbon on the right. The Old Forester was very smooth with full flavor and a spicy note. The Motley Cucumber is great and refreshing if Whiskey is not your thing. Whiskey Chips are great for the whole table, and they are a crowd pleaser. These house cooked kettle chips are piled high with Gorgonzola cream, crumbled Gorgonzola, chopped bourbon bacon, aged balsamic glaze and scallions. The Fried Mushrooms were pretty tasty also and were enough to share with our group. They were pretty simple with a crispy beer batter and served with a side of ranch. Bear Gully Reserve is on the left, and it is made by local distillery, Winter Park Distilling Company. The Black Forest with Rebel Yell Ginger and Godiva Chocolate is on the right. The Pork Belly Sliders with crispy pork belly, fried green tomatoes, house pimiento cheese and balsamic glaze on sweet Hawaiian rolls were out of this world. I would go back to The Whiskey just for these awesome little creations. Drunk Bison burger at The Whiskey is pretty damn good. This is a grass fed ground bison patty with beer cheddar cheese sauce, bourbon bacon, whiskey onion rings, served on a pretzel roll...and it's amazing. Of course we upgraded to the Parmesan Truffle Fries as well, and they were equally amazing. The Texas Mule made with Tito’s vodka and The Rocky Mountain Dram made with Tincup Whiskey on the right. One of the most popular burger choices at The Whiskey is of course, The Whiskey Burger. This comes topped with smoked Gouda cheese, bourbon bacon, whiskey onions and a dill aioli. This burger, as with all burgers served here are big and more than a mouthful. The Whiskey has some great salad selections on the menu, like this Whiskey Cobb Salad. This is loaded with Grilled chicken, chopped bourbon bacon, tomatoes, Gorgonzola crumbles, sunny egg, house pickled cucumbers and a lemon balsamic vinaigrette. They have a Steak & Bleu salad if you want beef in a salad, a Pickled Beet salad, and a classic Caesar on the menu that can all be served by themselves, or with a choice of protein. We visited The Whiskey on a Friday night, and it was packed. Like I said earlier, this place on the weekends, especially after dark gets going and the crowds fill up fast, and they do not take reservations. If you end up sitting close to the stage, be prepared to literally shout at your server and leave with a mild case of tinnitus. Having said that, we still really enjoyed The Whiskey. All of the food was really good, and my Bison Burger was superb. There is a reason they are often in the top of any best burger competitions in Orlando. All of the whiskey cocktails, regular cocktails and shots of the premium stuff were great also. Just be careful, a few whiskey’s, a few cocktails and few burgers will set you back a bit. The average burger price is around $15.00 and the apps start at around $10.00. Most cocktails start at over $10.00 and shots or tastes of various whiskey’s go from a couple of bucks to over $30.00, and it adds up fast. They do have happy hour specials Monday thru Friday from 4 pm to 7 pm and there is a decent amount of appetizers and a burger for a discounted price. The Whiskey is open Monday to Sunday from 11:00 am until 2:00 am. Have you been to the all new Teak Neighborhood Grill recently? I sure have and I can tell you it was great. This is the official second location for Teak. The original location is situated in the Hampton's living complex in the Metrowest community of Southwest Orlando. They have been steadily growing a reputation for not only gigantic and delicious burgers but also for their award-winning cuisine and laid back dining atmosphere. Since opening its doors in April of 2010, Teak has specialized in hand-crafted burgers, craft beers and cocktails, using fresh, local and organic ingredients in every dish. The newest location for Teak is aiming to do the same thing in a different part of town. The space the new restaurant is in was formerly occupied by Rangetsu. Once you walk inside Teak, it’s pretty hard to believe that an upscale Asian restaurant formerly occupied this space. They pretty much re-did everything, even down to the floors, which are polished concrete for a good down home neighborhood bar and grill feeling. I was pretty impressed with the layout and design of the place. It is certainly different and much larger than the original location, but they did a great job of recreating the environment from the original location. Just like the original, they are even tucked into The Village at Lake Lilly apartments, as the original location is located in the Hampton's living complex in the Metrowest community. 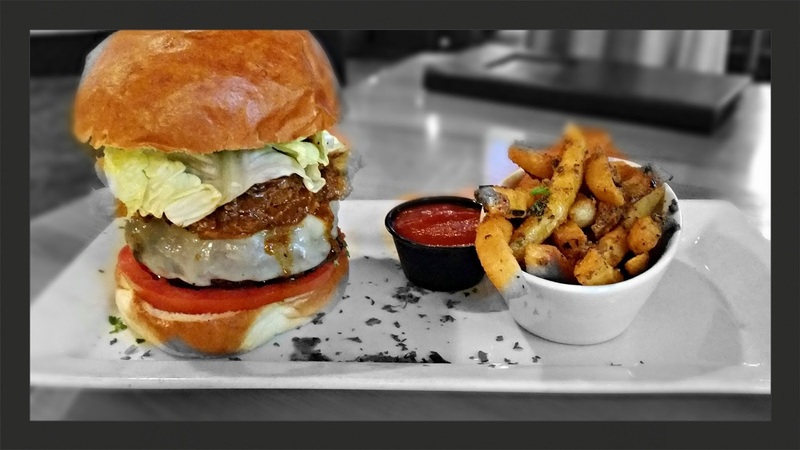 With the help of Executive Chef Matthew Reed, Teak has taken the gourmet burger scene in Orlando to a whole other level. Those burgers are becoming famous amongst the local dining community as well, with Teak having earned“Best Burger,” “Top 10 Burger Joint,” a “Must Do” in Central Florida and countless other recognitions. Visitors of Teak can choose from one of their 25 signature hand-crafted burgers like the Cronie Burger, which is a French doughnut tossed in Cinnamon and sugar loaded with beef and bacon or a PB&J Burger. Insiders get even more original and tasty options, with Teak’s password-only secret burger menu. While it may be hard not to order one of those crazy good burgers at Teak, they do have a large selection of other dishes. Other offerings include, edamame, salads, steaks, ribs, flat breads, an eggplant burger, and fish tacos to name a few. The bar and cocktail menu has plenty to offer as well with over 30 craft beers on hand and gourmet cocktails plus a wine selection. One of three bars inside Teak Maitland. Yes, they even have a dedicated wine bar at the new location. A traditional mule with Stoli on the left and a mule with Sailor Jerry on the right. The Fresh Fried Mozzarella Rounds are always delicious and a favorite of mine at Teak. How about these Loaded Pierogies? They were so good tossed in sour cream, chive and Sriracha Alfredo sauce with bacon and topped with frizzled onions. Two spicy cocktails on deck... the Cool Sewell on the left features muddled cucumber and jalapenos with Luna Azul Blanca Tequila and the Spicy Pineapple on the right is made with Tanteo Jalapeno infused Tequila and pineapple juice. In addition to great burgers, Teak serves up some awesome sandwiches too, like the " Hot Dead Animal Club" with sliced ham, turkey, pulled pork, and crispy bacon topped with melted Swiss cheese, lettuce and tomato on a brioche bun with herb mayo. The Philly Burger is on the secret menu, and features a fresh ground beef patty topped with sauteed onions and peppers and is covered in melted Swiss cheese. We had the Onion Rings for a side with this one. The Engine Oil Burger at Teak Maitland has sauteed peppers and onions, imperial stout glaze, fried egg, crispy potato strings and Swiss cheese on a pretzel bun. The side of Scalloped Potatoes are pretty awesome. You can get fries, tots, scalloped potatoes, or onion rings for a side with any burger or sandwich option. Although, I wanted the Ultimate Cronie, a fried croissant dessert, The Chocolate Lava Cake was a very good substitute, since they were out of the delicious cronie treat. This was a very rich and delicious treat filled with chocolaty goodness and topped with whipped cream and ice cream. I can tell you we really enjoyed our time there, and all of the burgers and food we tasted were superb. We sampled a total of three burgers, two appetizers and split a dessert, along with some great cocktails and a few craft brews. The newest location of Teak is pretty remarkable and they have done a wonderful job of keeping the neighborhood grill and bar vibe at the new spot. If you are in the area, check them out. You will not regret it. They do tend to get packed on the weekends, so plan accordingly. The Maitland location is open from Monday to Friday from 11:00am until 2:00am. On Saturday and Sunday, they open at 10:00am and close at 2:00am. Have you been to Teak Neighborhood Grill recently? I sure have and I can tell you it was great. Teak is situated in the Hampton's living complex in the Metrowest community of Southwest Orlando. They have been steadily growing a reputation for not only gigantic and delicious burgers but also for their award-winning cuisine and laid back dining atmosphere. Since opening its doors in April of 2010, Teak has specialized in hand-crafted burgers, craft beers and cocktails, using fresh, local and organic ingredients in every dish. With the help of Executive Chef Philip Romano, Teak has taken the gourmet burger scene in Orlando to a whole other level. Those burgers are becoming famous amongst the local dining community as well, with Teak having earned “Best Burger,” “Top 10 Burger Joint,” a “Must Do” in Central Florida and countless other recognitions. Visitors of Teak can choose from one of their 25 signature hand-crafted burgers like the Cronie Burger, which is a French doughnut tossed in Cinnamon and sugar loaded with beef and bacon or a PB&J Burger. Insiders get even more original and tasty options, with Teak’s password-only secret burger menu. In addition to all of that, Teak has 30 HD TV's and a 140" projector screen on a huge covered patio. 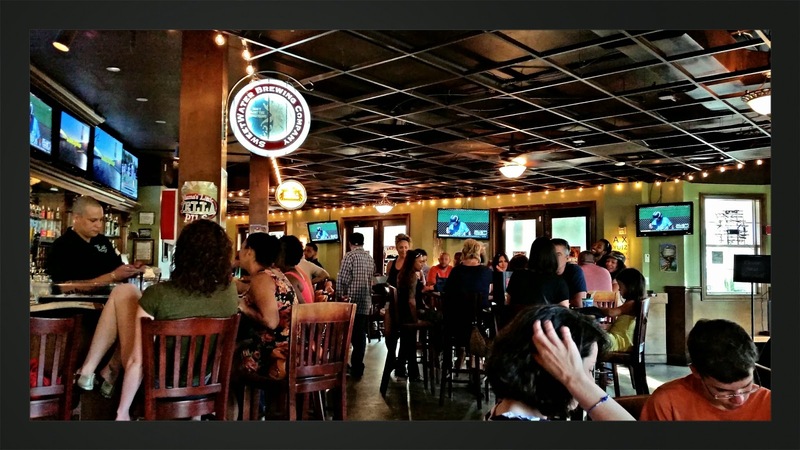 The atmosphere here is laid back and playful, especially if you are there for trivia night on Friday's. There is plenty of seating inside, but the outside patio is huge with lots of seating that would make it a great place to watch some football. We started our night with the Fresh-Fried Mozzarella Rounds. 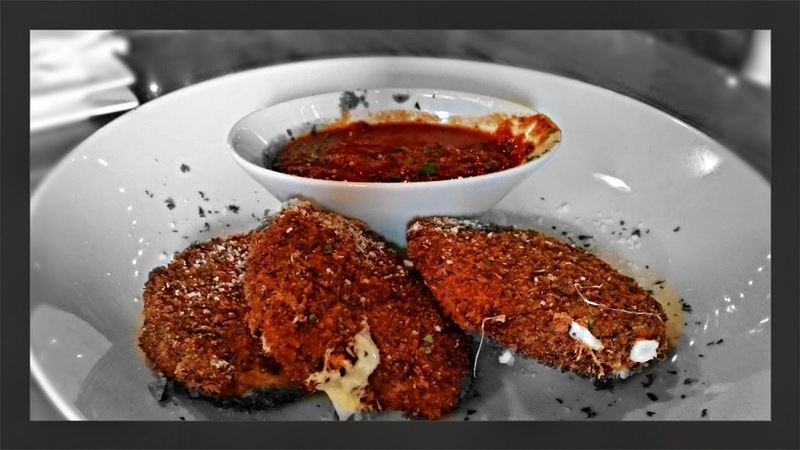 These were deliciously panko crusted pieces of fresh mozzarella quick fried and served with marinara sauce. The Along Came Danny Burger is a 1/2 lb. Angus Burger topped with provolone cheese, pulled pork, fried plantain, tomato, cilantro mayo, lettuce, drizzled with mango cilantro and served on a brioche bun...whew. The Not Yo Nacho Burger is a 1/2 lb. Angus Burger topped with chili, cheese, sour cream, jalapenos, salsa, and of course, nacho strips on a pretzel bun. Think Nachos on a Burger. Chef Philip insisted we try the Brazilian Burger which is a 1/2 lb. 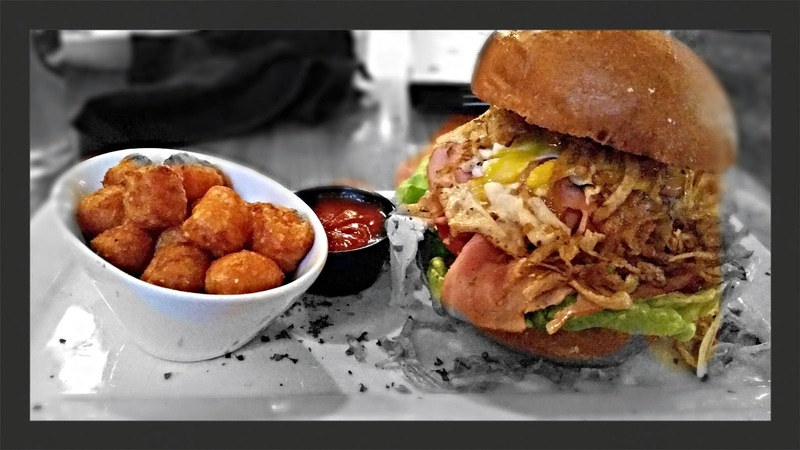 Angus Burger with ham, egg over medium, potato sticks, lettuce and tomato on a brioche bun. All burgers come with a choice of side item. We chose the Garlic Bistro Fries, Beer Battered Onion Rings, and Sweet Potato Tots, all of which were very tasty. Most of the burgers are in the $10 to $12 range and that includes a side. When you consider that a lot of these fast casual gourmet burger joints have a similar price point, you soon realize that Teak is offering a lot of bang for your buck and quite honestly a much better burger. Although we had no room for it..(who ever does?) we had to order the Ultimate Cronie. 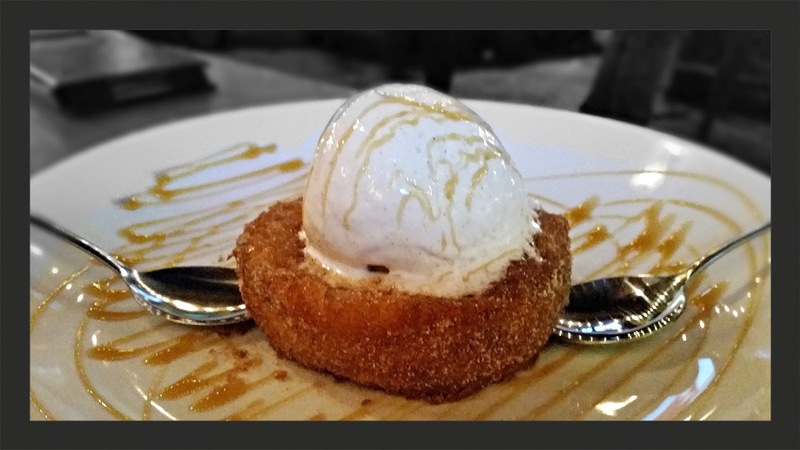 Its a twist on the famed Cronut with a French doughnut tossed in sugar and Cinnamon topped with vanilla ice cream and drizzled with caramel. This dish looked as good as it tasted, and it was phenomenal. Very light and not too sweet. 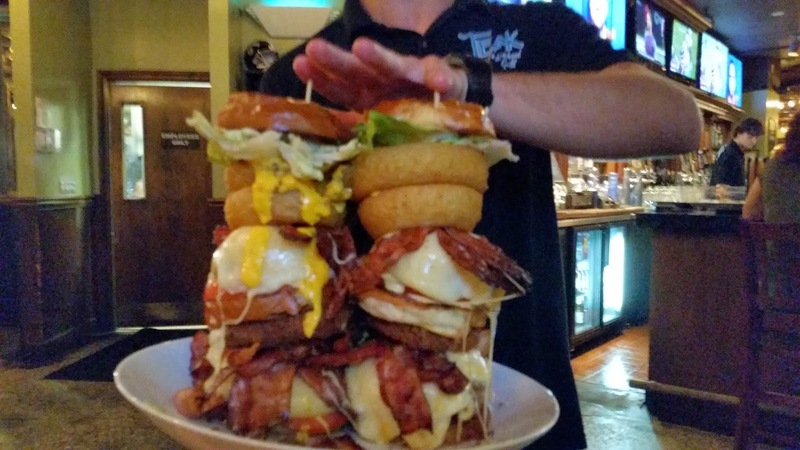 For those of you looking for a serious burger challenge, there is the Twin Teaks Burger Challenge. 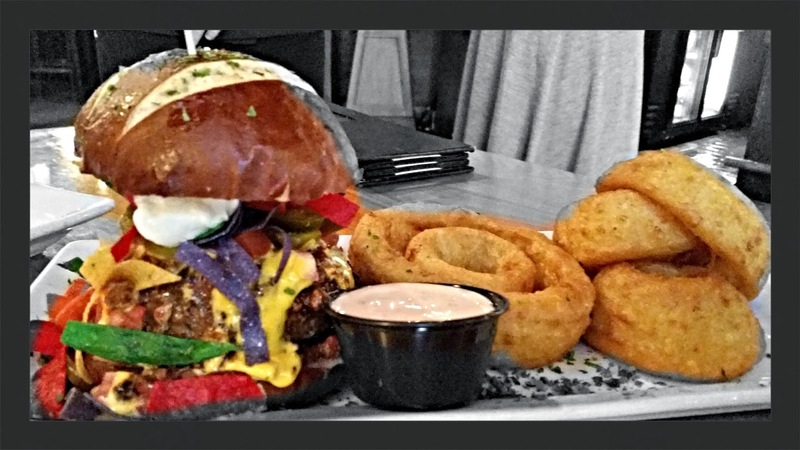 2 full pounds Angus beef, 9 slices American cheese, 9 slices Swiss cheese, 9 slices provolone cheese, 24 slices smoked bacon, 2 fresh fried mozzarella rounds, 4 beer battered onion rings, tomatoes, lettuce, Danny's beanless chili, cheddar cheese sauce & sliced jalapenos...try if you dare!! Teak truly is a neighborhood grill that it is nestled into the Hampton's Living complex and is a little bit off of the beaten path, but don't let that stop you from going there. One visit is all it takes to see why Teak should be everyone's neighborhood grill. From the gourmet burgers to crazy beer cocktails and a fun and lively atmosphere, I guarantee you will not be disappointed. Stop in and say hello and tell em Tastes Of Orlando sent you. Teak is open for lunch and dinner seven days a week from 11am until 2am and serves a full menu until close and they also offer a Sunday Brunch from 11am-3pm featuring the ultimate Bloody Mary bar.